This week on Friday, Saturday and Sunday the Gunnison Car Show will be held in Gunnison. There will be approximately 300 cars from all over the Western United States to be exhibited. In this story I am going to write about a few of the older cars and the people that donated them to the Gunnison Pioneer Museum. There are more than eighty collector’s cars on display. I will begin this article with our three newest car additions to the Andy Mallett Car Barn. The first two men who were very involved in the museum and were community minded, both passed away this past year, Bob Carr and Wes Bailey. 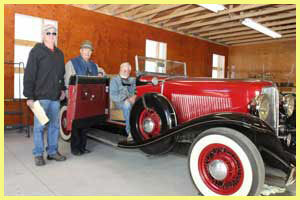 Bob left his 1920 Dodge Touring car through his estate to the Pioneer Museum. Bob always drove his car in the parades held in Gunnison. We will miss seeing his car in the parades. Wes Baily a long time member and Board Member of the Gunnison Pioneer Museum. During WWII Wes was captured and held as a Prisoner of War. Wes left his 1987 Cadillac to the museum in his estate. Our next addition to the Gunnison Pioneer Museum is the 1933 Auburn Speedster. The Auburn was gifted by an estate of the late Harold and Ellen Smith of Paonia, Colorado. The Smiths were past participants of the Gunnison Car Show and their local car club-The Ute Trail Car Club of Delta, Colorado. Harold and Ellen became a big supporter of the Gunnison Pioneer Museum during their past attendance at Gunnison’s Car Show. The second car is the oldest cars in the museum a 1908 Oldsmobile Touring Car. This car belonged to the Ed Leonard Family. Some of the features of this car include carbide headlamps, right side steering wheel. Outside gearshift and emergency brake and brass trim and radiator. Two controls under the steering wheel are the throttle and spark. The spark proved to be too dangerous and was discontinued. The car was started by the front end crank below the radiator. These cranks could cause a broken arm or wrist if the operator wasn’t careful. The 1918 black Dodge pickup used as an open sided delivery truck, has Nebraska license plates. This pickup was donated by Tom and Leona Redden. The next two cars we have both belonged to Forrest Kelly. A 1912 Ford Model T Pickup. Features are original parts except for wood fittings, carbide headlamps and brass trim. The second car is a 1930 Ford Model A 2-door Sedan. Some of the features of this car are; the gas tank is located in front of the windshield and seats four passengers. It is beige and black in color with orange wheels. These two vehicles are on loan to the museum by Frances Kelly. The museum has a 1939 Henney-Packard Funeral Coach. This car includes side trays to transport flowers and Mass Cards. This vehicle belonged to and was donated by C. J. Miller Family. Our next car is a 1939 Chevrolet 4 door Sedan. This car is on loan from the Don Eastman Family. The features include tires with large white side walls and there are not any sun visors on this vehicle. The last vehicle is a 1923 Ford Model T Fire Truck. This Red fire truck was restored by and on loan from the Gunnison Fire Department. It features include: Original wooden spoke wheels, chrome tank behind the seat for chemicals (soda and acid for grease and gas fires), it has three floor pedals which are Left for forward; Middle for reverse, and right for braking. The Gunnison Pioneer Museum welcomes all of the visitors in town and all of the Gunnison citizens to visit our cars and the Pioneer Museum displays. We are open 9:00am to 5:00 pm daily. Remember the museum is always accepting new members and volunteers. Just ask at the desk for an application to join the Gunnison Pioneer Museum.